Document groups are folders that organize the documents users upload to DocControl. Similar to user groups, you can assign access permissions and set various properties to document groups that are inherited by the documents inside. Right click on the DocControl which is root of the Hierarchy Tree and click “Create”. Enter the name My Starting Projectand click enter. This will create the document group, My Starting Project. We will upload all the documents for our project into this document group. 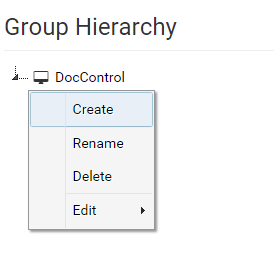 If you want to organize your documents further you can create sub document groups for your project. To do this, right click on Parent Group ‘My Starting Project’ and click “Create” to create a group within the group. You can create as many sub document groups as you like to organize your projects.